A new consumer unit will bring your home up to current electrical safety standards and would provide protection to your family and home. A new consumer fuse board unit will ensure your home conforms to current electrical safety standards, and would provide protection to your family and home. Many fuse boards are out of date and simply don’t comply with modern health and safety requirements. If your fuse board / fuse box has a wooden back board, cast iron or ceramic switches, or a mixture of fuses it is likely that it dates back to before the 1960’s. Older fuse boards / fuse boxes also offer little protection from electric shock. We would recommend you have your fuse board upgraded for a new 17 edition consumer unit. What is a consumer unit or fusebox / fuse board? A consumer unit or fusebox is used to control and distribute electricity around our homes. People have different names for distribution boards, they are known as: Fuse boxes, fuse boards, electric consumer box, consumer boards, consumer fuse boxes. The main switch in the distribution board allows you to turn off the electricity supply to your electrical installation. Some electrical installations have more than one mains switch. To give an example if your home is heated by electric storage heaters, you may have a separate consumer unit (fuse box) for them. The consumer unit should be easy to get to, so find out where the mains switch is to turn the electricity off in an emergency. Re-wirable fuses have a piece of special fuse wire running between two screws. When a fault or overload current flows through the fuse wire it will become hot. The heat will melt the fuse wire when the current goes above an acceptable level. The melted fuse breaks the circuit, disconnecting the faulty circuit. With this type of board you have got to replace the wire inside the fuse holder when it blows. Circuit breakers are automatic protection devices fitted in the consumer unit which switch off a circuit if a fault is detected. Circuit breakers are similar in size to fuse holders but provide more precise protection than fuses. When they ‘trip’, you can simply reset the switch. However, you first need to find and correct the fault. An RCD is a switching device that trips a circuit under certain conditions, and disconnects the electricity supply and should disconnect the supply within 0.4 of a second = 40ms. If your electrical installation includes one or more RCDs then test them regularly. 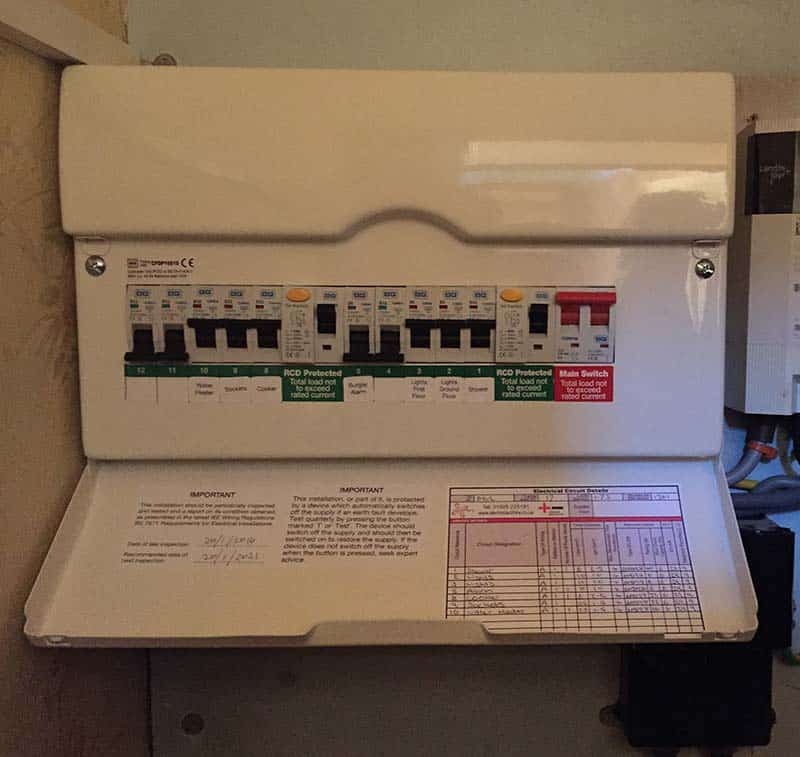 The typical cost of replacing a domestic fuse board is usually from £300 upwards. We provide FREE estimates to replace existing fuse boards with a Modern Consumer Units which provide a far greater level of protection. Many fuse boards are out of date and simply don’t comply with modern health and safety requirements. If your fuse board / fuse box has a wooden back board, cast iron or ceramic switches, or a mixture of fuses it is likely that it dates back to before the 1960’s. Older fuse boards / fuse boxes also offer little protection from electric shock. We would recommend you have your fuse board upgraded for a new 17 edition consumer unit. In all new build properties the IEE Wiring Regulations (17th Edition : BS 7671, Published 2008) requires circuits in domestic properties to be RCD-protected (residual-current device). The most common being a main switch with RCBOs protecting each individual circuit. An alternative method favours a main switch with two RCDs protecting separate DIN rails. If careful consideration is given as to what each bar will control in the way of upstairs and downstairs lighting and power circuits. With a old fuse board or consumer box with re-wireable fuse wire (BS 3036) when the fuse goes you have to replace the fuse wire, this could cause a few problems especially in the dark, not only that you have got to find what fuse has blown, then have to find your screwdriver to replace it. Does the fuse board in your rented property trip for no reason? We work with property landlords of all sizes rectifying electrical issues. K&L Electrical are happy to offer a free survey of your property and provide you with a free no-obligation quote to replace the fuse board and rectify any other issues. Electricity is dangerous and can kill. By law it is essential that your property meets all the current safety standards. All our electricians and staff are uniformed and carry company identification. Each electrician is qualified to the new 17th Edition IEE Wiring Regulations and CITY & GUILDS 2391 Inspection & Testing Certification of Electrical Installations. The NIC-EIC Insurance Backed Warranty covers work done by contractors registered to the NIC-EIC Domestic Installer Scheme. All of our engineers are fully CRB certified and NIC-EIC approved for complete piece of mind.